Golden Tate gets taken down in his NFC East debut. The good news for Eagles fans is: They only have to watch this for seven more weeks. The bad news for Eagles fans is: They have to watch this for seven more weeks. Mostly against the same brand of dreck that beat them Sunday night. It ended, effectively, as a poorly-coached, poorly-played game should have ended. With 1 minute, 17 seconds to play, Carson Wentz hit Zach Ertz for a 6-yard gain … on fourth-and-7. The Eagles lost, 27-20, to the Cowboys. They took Jason Garrett off the hot seat. They made owner Jerry Jones — the huckster who, it seems, hasn't won anything since Bob Wills and the Texas Playboys were in the Hot 100 — smile his hollow smile. The Eagles fell to 4-5, two games behind the Redskins and tied with the Cowboys. "We've got to believe, despite the evidence," said Ertz. "And the evidence is, we're not a very good football team." Ertz is a very, very good player; the team's best offensive player at the moment, on a record pace for tight ends: more than 133 catches and more than 1,400 yards. He finished Sunday with 14 catches, two of them touchdowns, with 145 yards. He needed 146. Four of the Eagles' final seven games come against the NFC East, so there's that chance for salvation. "We're not out of it," said Jason Peters. "The division's still wide open." Peters knows the Eagles should be the division's best team, but they are not. Neither is Dallas. Washington, now 6-3, claims that distinction by default. The Eagles get to play them Monday night, Dec. 3. At this point it cannot matter if the Birds, the 'Boys or the 'Skins win this division. They'll only be a speed bump for some good team. There are no good teams here. With their season on the line and with a fearsome road trip to New Orleans looming, the Eagles exited their bye week in an inexplicable, somnambulant torpor. They had won two of three games, got a much-needed break and seemed refocused for a second-half run. And, then, this. "We did take a step back tonight," coach Doug Pederson admitted. They clearly were uninspired by the acquisition of wide receiver Golden Tate, whom, over the bye week, they rented for eight weeks at the cost of a third-round draft pick; then used seldom, and to little effect: two catches, 19 yards. Meanwhile, Ezekiel Elliott continued his dominance over the Eagles. His 187 yards from scrimmage Sunday night gave him 476 yards in his three career games against the Birds, an average of 158.7. To be fair, this was not the cream of the Eagles' roster, but then neither was the roster that won Super Bowl LII. Sunday night, right tackle Lane Johnson's torn knee ligament — suffered before the bye — kept him off the field in favor everyone's favorite punching bag Halapoulavaati Vaitai, who bookended Peters, a 36-year-old, reconstructed-knee, quad-strained, biceps-torn left tackle. The offensive line was the picture of health compared with the secondary. By the game's fourth quarter, after Ronald Darby injured his knee, the Eagles were down to just one of their five starting defensive backs — Malcolm Jenkins, the oldest one. Rasul Douglas, a third-round pick last season, had proven himself completely unready for extended playing time. The Eagles had two Sullivans on the field, Tre and Chandon. They don't look much alike, but it was hard to tell them apart. The Eagles acquired Tate to bolster the arsenal at Wentz's disposal, after he'd spent the bye week eliminating waterfowl with a friend named Trout. It showed. The nifty footwork Wentz developed in the offseason and through his first six starts somehow evaporated into a flurry of off-target efforts for the first 35 minutes. He threw an interception on the first play of the second series. He finished 32 for 44 for 360 yards with two touchdowns and an interceptions. He was infinitely worse than that. It's hard to overstate the ordinariness of the Eagles' opponent Sunday. Star linebacker Sean Lee missed the game, but the defense, nonetheless, was stout. The Cowboys built their roster on the shoulders of the offensive line, but, already playing without all-pro center Travis Frederick (autoimmune disorder) and rookie guard Connor Williams (knee surgery), they lost guard Zack Martin for part of the game, too. He returned. The Redskins — that wretched refuse that exists just inside the Beltway — remained atop the division, as if that's anything to relish. Their own offensive line decimated, they outlasted a bunch of Buccaneers that had squeezed out a win over the Eagles in the second week of the season (Nick Foles' farewell game). That makes them definitively better than an Eagles team Wentz and top receiver Alshon Jeffery, who missed the first three games. The Cowboys played like every bit a sub-.500 team. They illegally blocked an Eagle in the back — and into the returner. They false-started as they went for it on on fourth-and-1, which made it fourth-and-6, which convinced them to punt. 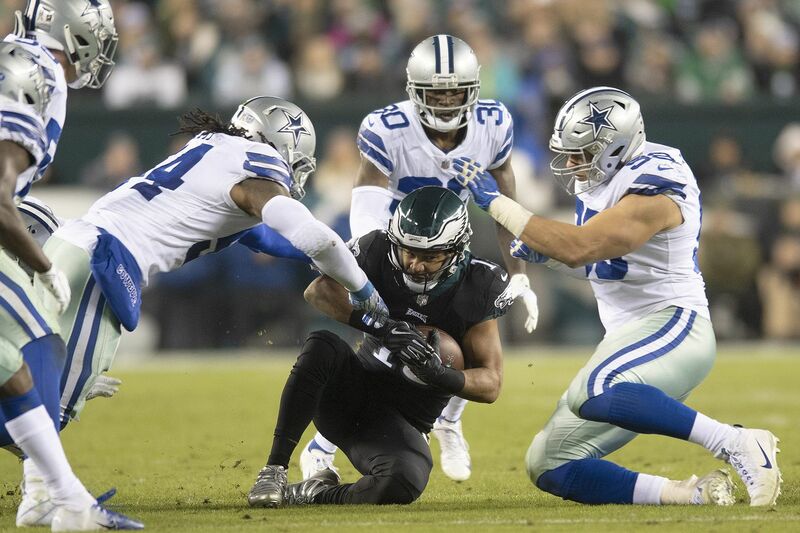 Not to be outdone, the Eagles went for it, fourth-and-one at the Cowboys' 20 … and lost 3 yards. So they were outdone, in a way.